On the outskirts of Chennai in the state of Tamil Nadu we met up with Sashi Ananth, a local architect with a degree from Madras University, who treated us to a day of touring ancient architecture, beginning in Mahabalipuram. Our lesson began with a description of the ways in which temples originated as a representation of the divine and a location for individual experiences in prayer. As we were reminded in an earlier lecture, Hinduism is not a communal religion, and the temples merely provide a sanctum in which the macrocosm or paramathma, meaning Brahman, is in dialogue with the microcosm or jeevathma, meaning individual. 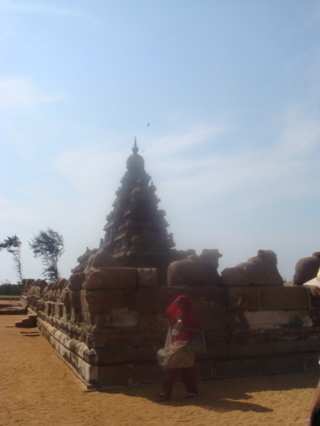 In the 5th and 6th centuries, temples, such as The Shore Temple we witnessed began to represent a complex or precinct reminiscent of a Buddhist shrine. Most face toward the east, and this particular temple housed Shiva on one end and Vishnu on the other. 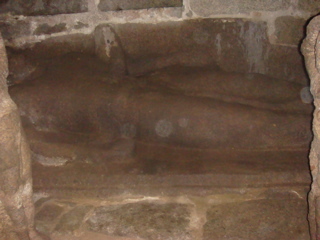 Vishnu, we discovered, is lying in tranquility, while Shiva is represented by a column of light. Sashi explained that this column extended from the top of the head to the base of the body and signified the act of creation–husband, wife and child–as the masculine and feminine integrate and reflect the aspiration to become Brahman, who is formless and genderless and divine. 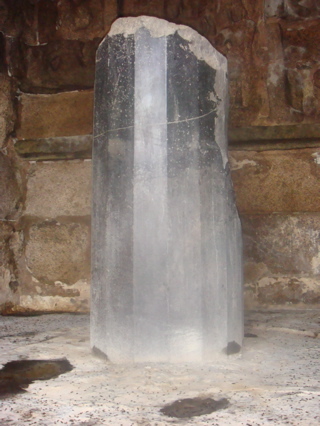 Unfortunately, westerners have interpreted the column as phallic and, therefore, too explicit in nature. 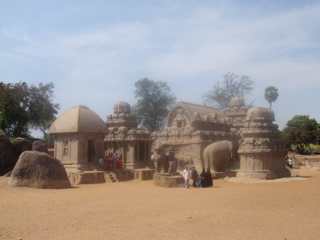 From here we traveled to the 5 Rathas, or chariots: a series of sculptures carved into the existing rocks, demonstrating various types of architecture. Our final destination was to meet V. Vedanthan, a local sculptor. We toured his facility where we witnessed the various artists at work on their marble creations. Of course, we spent the conclusion of our time shopping in his store, sorting through the many marble and iron statues, bowls, and various pieces of craftsmanship, most far too large to bring back to the states (and believe me if we could we would!). We were met by V.R. Devika, Managing Trustee of the Aseema Trust, who specilaizes in arts education. Because it was extremely hot we began inside with an overview of the facilities and then we hit the gift shop where we supported the many artisans by purchasing examples of their arts and crafts–some for ourselves and some for family and friends. I received great joy in shopping since the proceeds went to the artists themselves, many of whom are women brought to Dakshina Chitra to learn a craft and become empowered by their ability to provide a financial income for themselves and their families. After shopping we began our tour. Most of the houses and huts were made from remnants of a variety of homes throughout the region destined for demolition. Classes were designated by the inhabitant’s craft and signified through the materials used to build the home (Bermese teak for the upper class and local wood painted brilliant colors for the weaver’s dwelling). 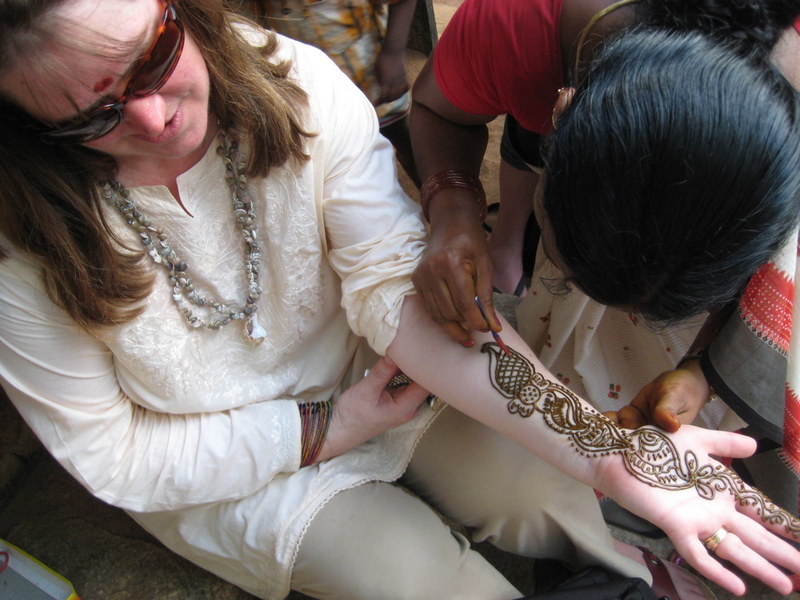 We even managed to meet some of the artists, including a henna painter who decorated all of us women with beautiful drawings. Most significant here, however, is the preservation of cultural art–everything from wood carvings to woven fabrics demonstrates a joyful celebration of the people and their traditions. Following our tour, we retreated to a small room where Devika provided a short lecture on Gandhi as performer, as well as a performance of her own. Part cultural historian, part actor, she managed to weave together stories from mythology with the theoretical work she is conducting around Gandhi’s life performance, including the many ways in which he managed to put his life’s work on the world stage, dressing in ritual mourning clothes, and through demonstration (perhaps the Greek mimesis?). 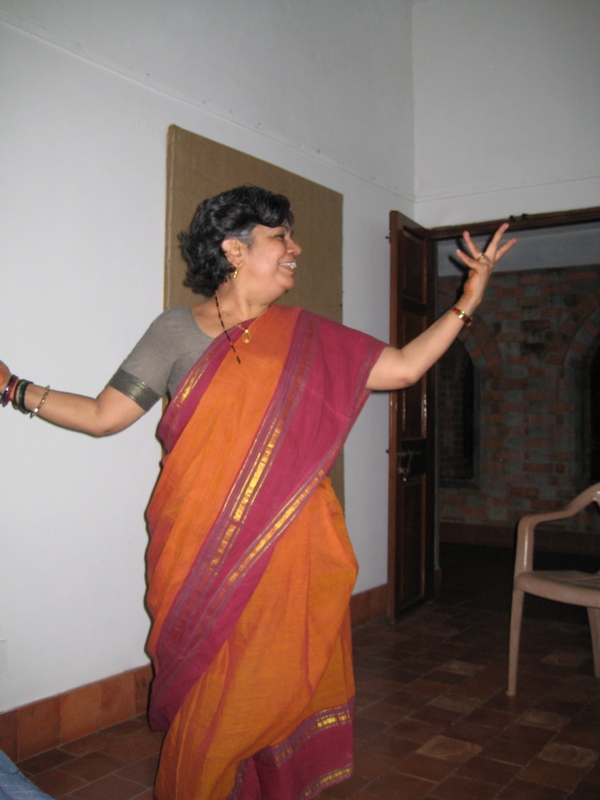 Much of her research is grounded in performance theory drawn from the Natyasastra and the 5th Veda, which explores the primary elements of performance (the body/gesture, language, spectacle, and emotions). Despite the sweltering heat we watched and listened attentively to the description and performance of her closing dance that embraced all of the earth’s creatures through a strong connection to the earth. As we drove away I was left hoping that we might be able to make further connections with Dakshina Chitra and its offering of Indian cultural artifacts displayed through its strong effort to preserve the many arts and crafts.